The enduring popularity of the Mid-Century Modern style furniture range is based on many factors. It gives us clean lines, gentle organic curves, a love for different materials. These lovely furniture pieces will grace any home office environment. 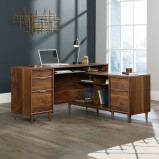 Contact Us for more information on our range of Cheap Mid-Century Home Office Furniture. 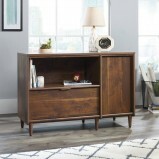 Clifton Place Executive Credenza The beautifully finished Clifton Place storage credenza is a stylish and practical option for any home office environment. 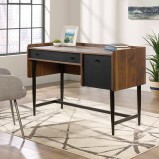 Features Stylish credenza in Grand Walnut finish Smart M..
Clifton Place Executive Workstation The beautifully finished Clifton Place executive desk is a stylish and practical option for any home office environment. Features Beautifully appointed executive desk in Grand Walnu..
Clifton Place L-Shaped Executive Workstation The beautifully finished Clifton Place L-Shaped executive desk is a stylish and practical option for any home office environment. 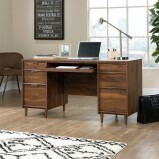 Features Beautifully appointed L-shaped de..
Hampstead Park Compact Workstation The beautifully finished Hampstead Park Compact Desk offers a stylish solution for any home office or study. 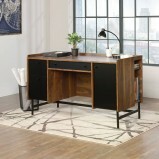 FeaturesMid Century style compact desk in Grand Walnut finish Modern black accent pan..
Hampstead Park Workstation The beautifully finished Hampstead Park double pedestal desk offers a stylish solution for any home office or study. 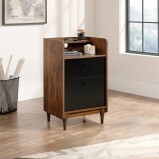 Features Mid Century style desk in Grand Walnut finish Modern black accent..
Hampstead Park Storage Unit The beautifully finished Hampstead Park Storage Stand offers a stylish solution for any home office or study. Features Mid Century style storage stand in Grand Walnut finish Modern black accent pa..